The time I have to get ready in the morning is my "me time." I enjoy taking my time and putting my makeup on. However, I don't enjoy spending forever drying my hair. In the warmer months I keep my hair wavy so I am not heat styling as much. This time of year I either wear my hair wavy or straighten with a blow dryer. Since my hair is long and thick, this process can take quite a while. 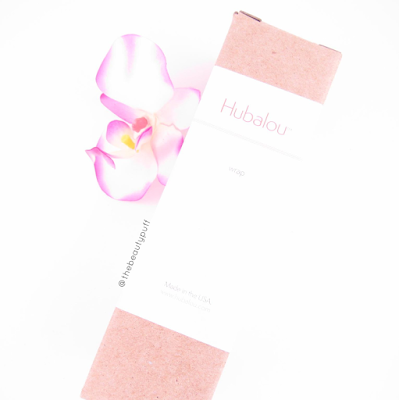 One thing that has been helping my morning routine lately is my Hubalou Wrap! 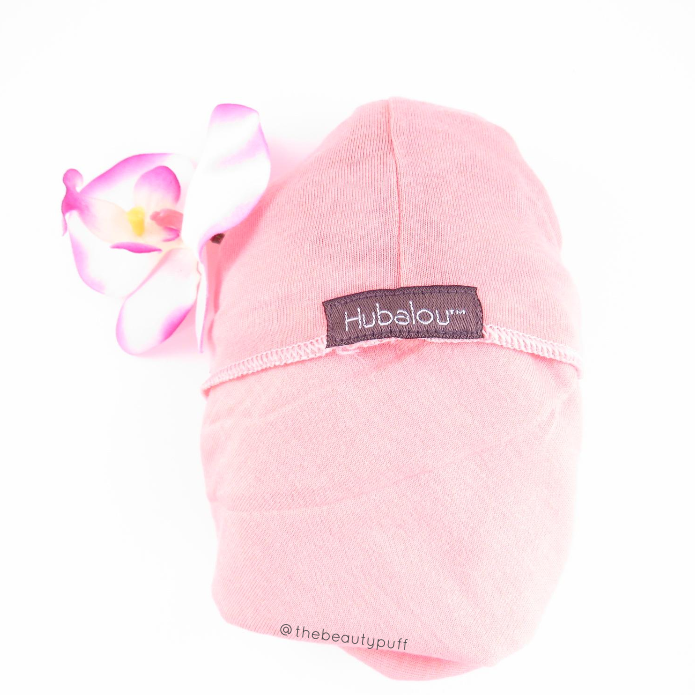 What is a Hubalou Wrap? A Hubalou Wrap is made of bamboo which is incredibly absorbent. While you wear it and go on with your routine, it gets much more moisture out of your hair than a typical towel would. It doesn't get every bit of water out, just the right amount so you are left with frizz-free, manageable hair that's easy to style. Many times I get out of the shower and see my waves, wishing they would stay just as they are! With typical towel drying/styling, my waves get frizzy or "stretched out" so they are difficult to maintain. Regular towels, including microfiber and terrycloth, have texture that catches hair. The Hubalou Wrap is soft and smooth, so your hair is not pulled or disrupted when you remove it. So how does the Hubalou wrap work for me? How to: When I get out of the shower, I gently squeeze a bit of moisture out of my hair using my regular towel, then wrap with my Hubalou wrap. The Hubalou label goes on the back of your head, right at your hairline. You simply bring rest of the towel toward your forehead, twist toward the back, then tuck near the label. It is the same process as with a typical towel, except the soft Hubalou fabric is much easier to work with and there is plenty of it to go around long, thick hair. It stays put, unlike bulky towels and allows me to go on with my morning routine. Now the time my Hubalou wrap stays in my hair varies day to day. On some days, when all I have to do is work around the house, I have literally forgotten it was on and worn it for around two hours. I then think, "Oh no! There's no way I can deal with my hair now!" I worried about creasing, particularly near my hairline which I have experienced with a microfiber towel. Once that happens, I can't wear my hair wavy, I have to straighten. But to my surprise, no creasing! No matter how long my Hubalou wrap has been in my hair, the styling is up to me and it takes much less time. After wearing my wrap for quite a while, I've had volume in my hair as soon as I remove it. I don't think I have ever seen that effect in my hair after removing a towel! I simply applied my hair serum and styled as usual. Speaking of hair products, you could also apply a leave-in conditioner prior to wrapping for ultimate hydration. This is definitely something I will do as the air gets dryer and static becomes a big issue for my long locks. For those that wondered, the towel I used before my Hubalou wrap was a Turbie Twist. Since I started using my Hubalou wrap, I haven't reached for that towel once! I much prefer how my hair looks and feels after using my Hubalou wrap. Not to mention it stays put SO much better in my hair. I have also used a typical microfiber towel and it doesn't even compare. If you want a comfortable, absorbent wrap that helps expedite your morning routine, I highly recommend you look into a Hubalou wrap. They also come in beautiful colors: Petal, Slate, Plum, Fresh Cream and Twig Stripe. You can even save a bit by getting multi-packs and give them as gifts this holiday season! Want to save 20% off your purchase from Hubalou? Use code: PUFF at checkout!